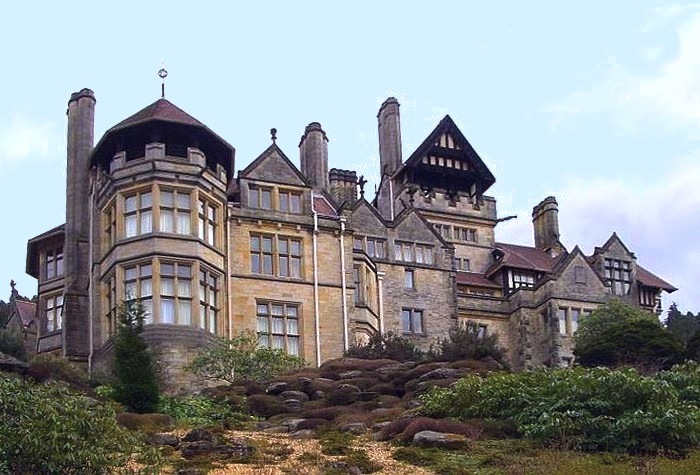 Cragside (west front) in Rothbury, Morpeth, Northumberland. Designed by unknown builder-architect, 1864, and Richard Norman Shaw, 1870-77, and 1883-85. 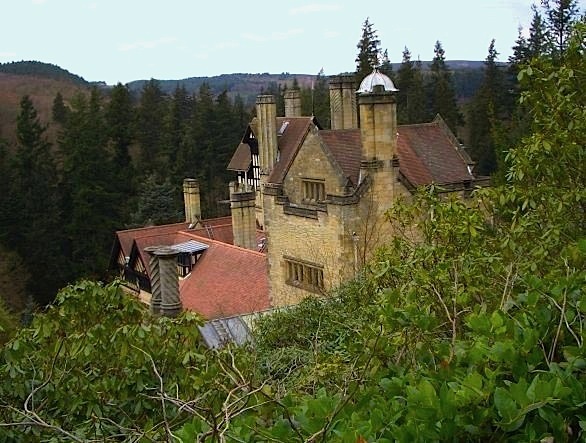 William George Armstrong, Baron Armstrong of Cragside (1810-1900), first began this country house, which is now in the hands of the National Trust, as a sporting lodge. Soon deciding to have it rebuilt for himself and his wife Margaret as a full-scale country estate, he commissioned R. Norman Shaw to do the work. Shaw was not yet widely known and, as Nikolaus Pevsner and Ian Richmond say, this house has "none yet of the finesse of his Chelsea homes of a few years later" (244). Indeed, Reginald Turnor uncritically passes on "the story that the architect designed the great Northumbrian house in one day, while his host was out shooting — a nice contribution to the saga of Victorian industry" (101). The truth was obviously much more complicated than that. Stafford M. Linsley, for example, says that the "result was not entirely to Shaw's satisfaction, for Armstrong kept close control of the project," and Pevsner and Richmond suggest that some of the later additions were designed by Armstrong personally. Nevertheless, Shaw's original rough sketch seems to have determined the general scope and style of the project. Commentators often use the word "Wagnerian" about the finished structure, but it is not to everyone’s taste. Turnor, who finds it "super-romantic," refers to the "mass of flamboyant and rather sickening detail" on the chimney-piece added in 1880, that extends right up to the drawing-room ceiling (101; designed not by Shaw himself but by William Lethaby, who was then assisting him). 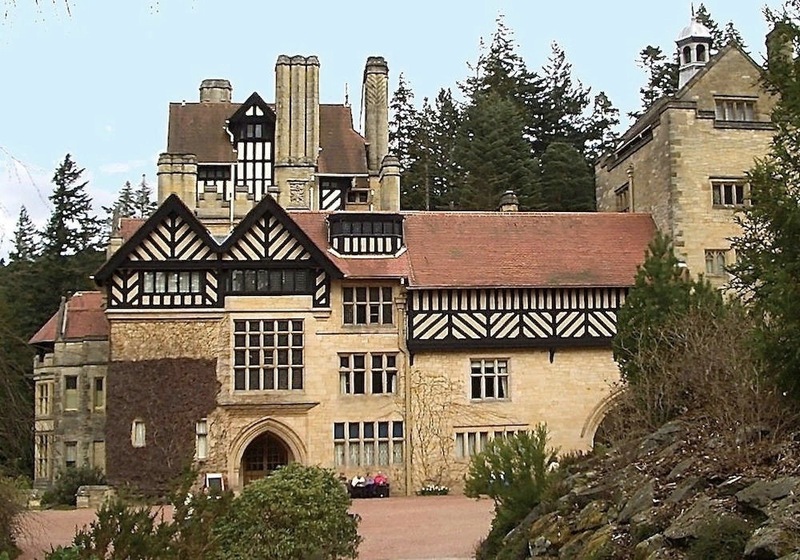 Pevsner and Richmond, on the other hand, seem impressed by Cragside's "high picturesqueness" and write that it is "the most dramatic Victorian mansion in the north of England" (244). 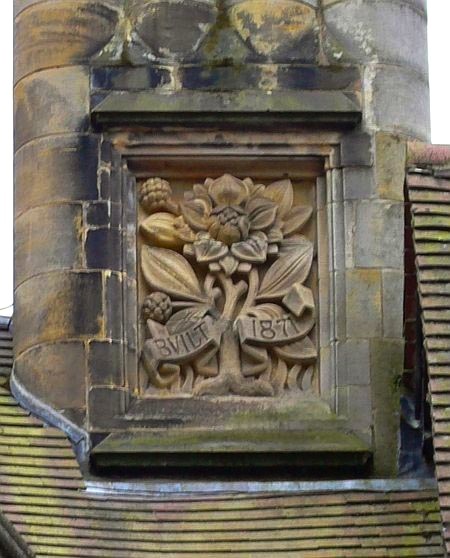 Linsley, who was involved in the revision of Pevsner and Richmond's work, adopts this verdict word for word, adding that it "did enhance Shaw’s reputation as a designer of the picturesque." The interior of Cragside is of special interest for its paintings, including a portrait of Armstrong by George Frederic Watts, a fine collection of Evelyn de Morgans (such as The Soul's Prison-House, illustrating William Morris's "Chants for Socialists"), its Morris stained glass done to the designs of Burne-Jones, Rossetti and Madox Brown, and sculptures, such as two busts of Armstrong himself by Alexander Munro. It is also remarkable for all its technological innovations, such as its heating, lighting and early telephone systems. It was the first house in the world lit by electricity (National Trust Handbook 321), using first hydraulic-powered arc lamps, and then the newly-invented incandescent lamps. It even incorporates a passenger lift. 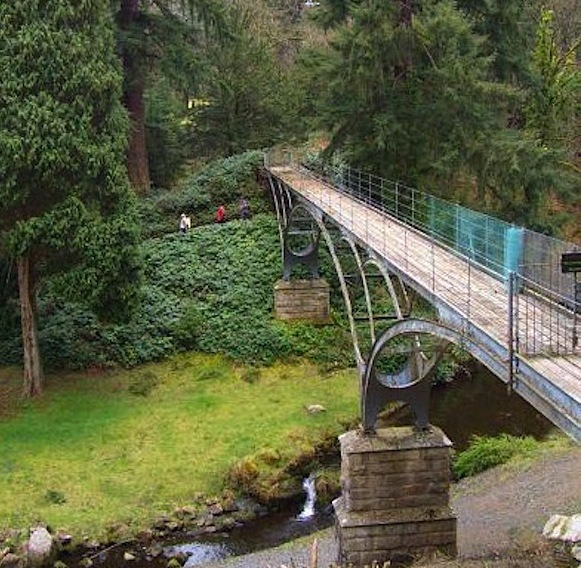 Also noteworthy is the scale of the grounds, which, apart from the workings of his hydroelectric system, contain millions of trees (including the tallest Douglas fir-tree in England); an iron bridge (shown on right) designed by Armstrong and made at his own works in the 1870s; one of the largest landscaped rock-gardens in Europe; an Italian terrace, and so on. All this was at Armstrong's own direction, on what was originally bleak open hillside. The house was considered one of the wonders of the age, and was visited by the Prince and Princess of Wales in 1884, as well as by the Crown Prince of Japan and other notables. It still makes an enormous impact on visitors, who, unusually, can use a courtesy mini-bus or their own cars to get around the vast estate. Linsley, Stafford M. "Armstrong, William George, Baron Armstrong." Oxford Dictionary of National Biography. Online ed. Viewed 14 July 2007. Pevsner, Nikolaus, and Ian Richmond. The Buildings of England: Northumberland. Harmondsworth: Penguin, 2nd (rev.) ed.1992. Turnor, Reginald. 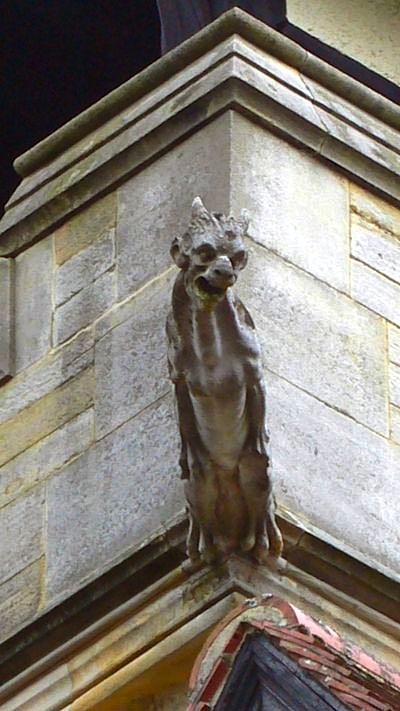 Nineteenth Century Architecture in Britain. London: Batsford, 1950.